Happy Independence day friends. 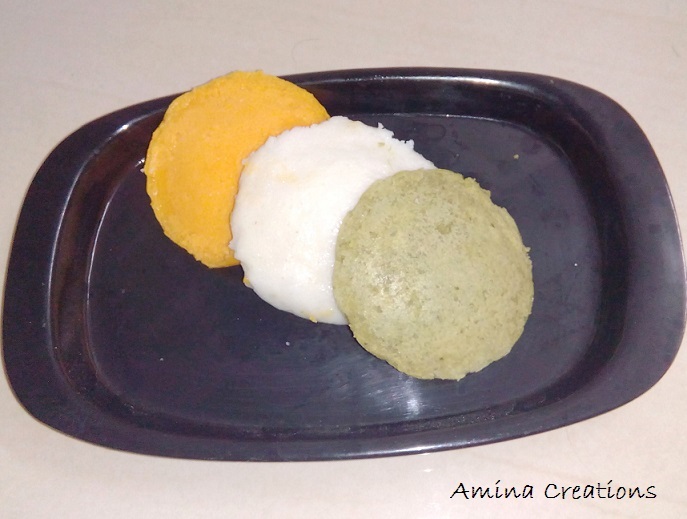 To celebrate the spirit of independence day, I made tri colour idlis. Here I have used raw carrots and spinach to get the colours. In the same way you can make tri – colour rava/ sooji halwa, tri colour upma, tri colour pooris, etc. Do share what you made this Independence day in the comments section. Finely chop the carrots and grind it into a paste along with some idli batter. Pour it into a bowl, add a pinch of soda and salt to taste and mix well. Keep ready. Boil water in a pan, add the spinach leaves and cook for a couple of minutes. Now squeeze out all the excess water and grind it to a fine paste along with some idli batter. Transfer to a bowl, add soda and salt to taste and mix well. Keep ready. Make sure the carrot batter and spinach batter are thick. Grease the idli moulds with some oil, add the carrot idli batter, spinach idli batter and plain idli batter into moulds and steam for about 10 minutes till the idlis are cooked. Allow it to cool down and remove them to a serving dish. Serve hot with groundnut chutney, tomato chutney and sambar.